Are you prepared for a hurricane that turns your home into rubble? An earthquake that leaves you and your family without shelter, food, or water? A flood that makes your home unlivable? Most people don't want to think about those things until it's too late. Ted Wright, who came of age in London during the Blitz of World War II, has extensive experience dealing with natural and man made disasters. He knows most problems occur after the disaster, not during it, and tells how to plan beforehand to enhance the chances of surviving the aftermath. This book covers a variety of possible disasters and considers almost any place one might happen to be when it strikes. In all cases, advance planning combined with relatively inexpensive preparations will greatly enhance your chances of survival, whether you are caught at home (including mobile homes and condos), at work, at school, or on the road. It even has a special distaster plan that elementary, juniour high, or high schools should not be without. 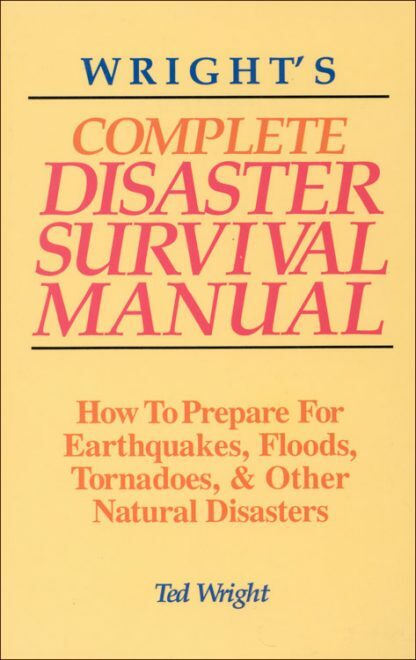 With dozens of drawings and ideas, including food torpedoes, quake-resistant shelters, medicine chests, and water-storage trenches, this survival manual will be a life-saver for anyone caught in a major disaster. Tim Wright has been a collector of one-of-a-kind nostalgic items since childhood. Ten years ago he founded the Wright Card & Gift Company, which produces signature cards, journals, magnets, and other gift items that feature his unique artwork and love of the past. His first book, Raging Beauties is a perfect combination of his sense of humor and his love of vintage images. Tim is proud to say he is a product of all the years he hung out with his mother, grandmother, and sisters, listening to every word and loving every minute of it! He lives in San Francisco.